By Laura Hazard Owen @laurahazardowen Jan. 16, 2019, 11:37 a.m.
With a new personal Twitter project, Patrick Healy — the Times’ politics editor and previously a reporter covering the 2004, 2008, and 2016 campaigns — is trying to address some of those concerns by giving people a view into the paper’s decision-making process. Healy “wanted to start engaging with readers about our intentions behind our stories,” he told me, in the hopes that more transparency — about why stories are chosen, why they’re framed a certain way, and what kinds of conversations go on between reporters and editors behind the scenes — can shore up trust in the Times’ motives. Healy’s first Twitter thread, written from a train, was on Saturday, January 5, for a story by Lisa Lerer and Susan Chira on whether a woman will win the 2020 U.S. presidential race. In the thread, Healy talked about how he and the reporters had worked to avoid sexist or gendered thinking in the piece, and how the Times’ 2020 coverage of female candidates won’t dwell on Hillary Clinton’s 2016 loss. Healy is doing a thread for any major political story he thinks would benefit from context and clarity about intent, “and also when I think I can provide some behind-the-scenes insight or illumination that readers might like.” He ends each one with his direct email address, asking readers to write to him with comments and feedback. The thread that’s gotten the most engagement so far was the one about racist Iowa congressman Steve King’s influence over Trump; in it, Healy explained why the Times was giving a racist a platform. Sunlight is the best disinfectant for views like King’s. 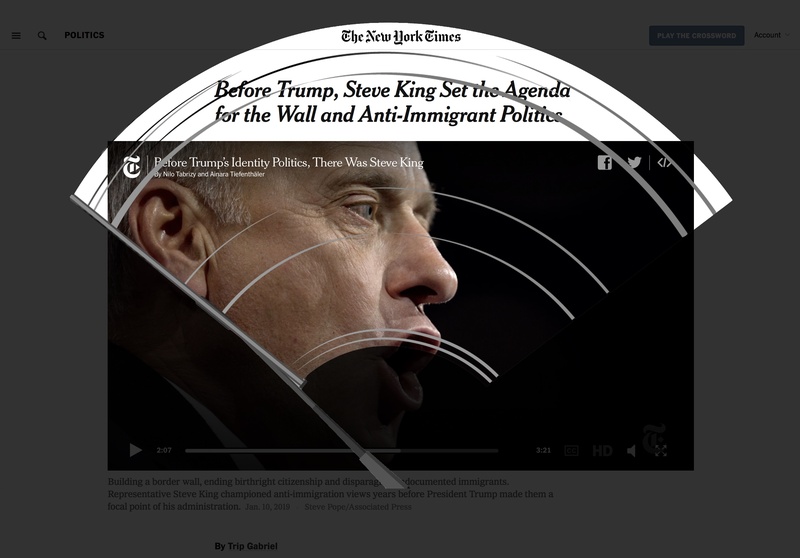 We examined King's comments — he promotes neo-Nazis on Twitter, he has spoken to far-right publications about migration and the "Great Replacement" conspiracy theory, he has demeaned and vilified immigrants and Latinos. King’s side was mostly people who look like him. “You could look over there and think the Democratic Party is no country for white men,” he said. In another thread, Healy asked readers to suggest policy issues that they wanted to see covered. The story looks at how some new House members won in November on their scientific backgrounds, like Rep. Joe Cunningham (D-S.C.), but changing Congress’s perspective is easier said than done. This is a personal project for Healy, not part of a larger initiative at the Times, though it fits in with the paper’s goals to engage with readers in authentic ways. I can’t see inside Healy’s email inbox, but a glance through the replies to his tweets so far turns up quite a bit of grandstanding and random remarks like “Ffs,” “nailed it!” etc., sprinkled with constructive comments of the sort that Healy is looking for. But many of the tweets in his threads are retweeted or favorited much more often than they’re replied to, suggesting that some people are getting a benefit just from reading. POSTED Jan. 16, 2019, 11:37 a.m.
Owen, Laura Hazard. "The New York Times politics editor is building trust by tweeting context around political stories." Nieman Journalism Lab. Nieman Foundation for Journalism at Harvard, 16 Jan. 2019. Web. 20 Apr. 2019. Owen, Laura Hazard. "The New York Times politics editor is building trust by tweeting context around political stories." Nieman Journalism Lab. Last modified January 16, 2019. Accessed April 20, 2019. https://www.niemanlab.org/2019/01/the-new-york-times-politics-editor-is-building-trust-by-tweeting-context-around-political-stories/.